1-3 Diploplegma banzare Riedel; 1, VS-R-90Ba, 1-3cm, Y31/3, 300x; 2, cortical shell spongy, VS-R-194b, 1-3cm, M22/3, 300x; 3, focus on surface of cortical shell, same specimen as fig. 2, 300x. 4-5 Amphisphaera cf. uranus Haeckel; 4, VS-R-27b, 1-3cm, E14/4, 300x; 5, VS-R-46a, 1-3cm, L32/1, 300x. 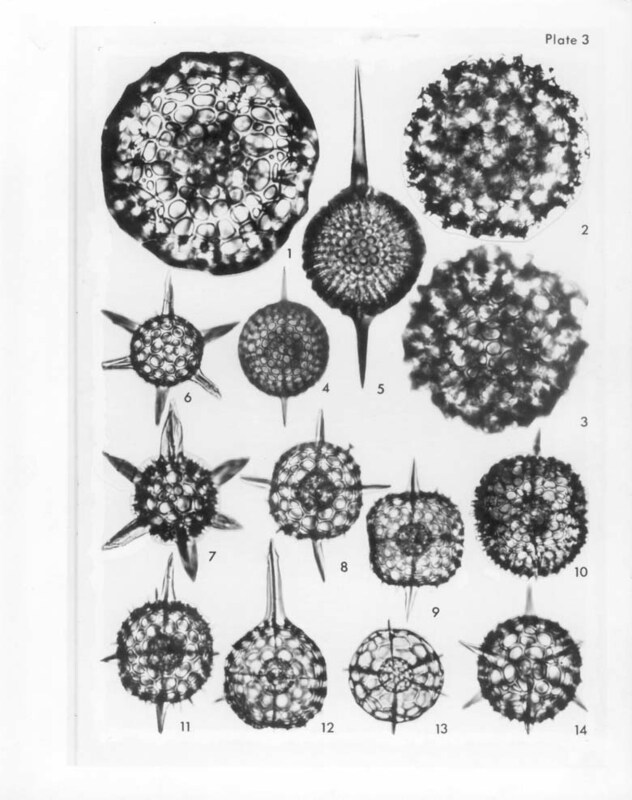 6-7 Hexastylus triaxonius Haeckel; 6, VS-R-71a, 1-3cm, D32/3, 300x; 7, VS-R-81a, 1-3cm, V18/3, 300x. 8-11 Stylacontarium bispiculum Popofsky; 8, VS-R-71a, 1-3cm, O22/0, 300x; 9, VS-R-81a, 1-3cm, W46/3, 300x, 10, VS-R-92b, 1-3cm, U31/3, 300x; 11, VS-R-71a, 1-3cm, D17/0, 300x. 12 Doryconthidium ? sp. ; VS-R-71a, 1-3cm, K40/4, 300. 13-14 Hexacontium entacanthum Jörgensen; 13, VS-R-81a, 1-3, W27/3, 300x; 14, VS-R-71a, 1-3cm, R26/4, 300x.